players are split into 2 groups half of group spread out around the outside of the square and act as servers. work for 1 minute progressivel serving ball wider so player vollying is gradualy extended range of motion. 2, servers now do 3 deep squats when available ball out front then 3 ball above head. key points. sit back on heels back flat. this time players inside have to go through red gates then straight through centre poles to another server. 4. server now passes ball along ground player inside bo recieves and passes bac then must turn and go through red gates followed by going into centre poles and turn whils inside in another direction then go to another server and recieve of opposite foot and pass back. 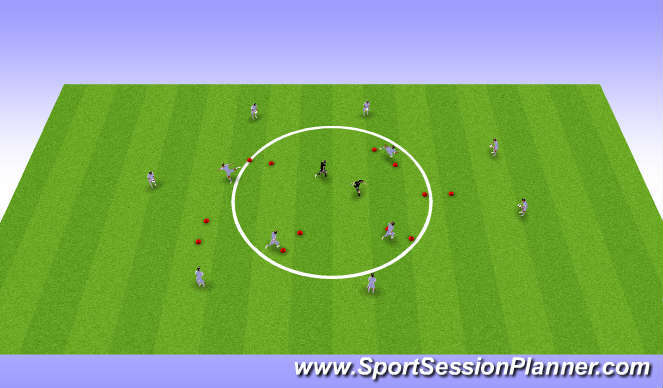 reaction - one touch- fast turn out- ensure pass direct.